I love bookmarks! 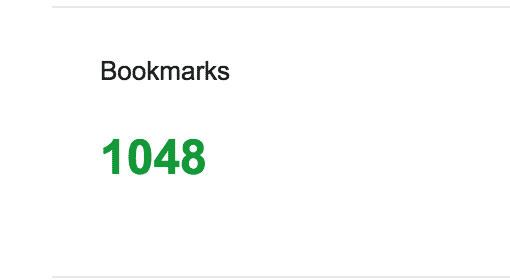 In fact, I love them so much that I accumulated more than one thousand saved bookmarks. It sounds like total chaos but most of them are sorted carefully in folders. If you want to check how many bookmarks you have saved in your Chrome account, all you need to do is visit this link. Although bookmarks make it easy to go to frequently visited sites, they aren’t perfect. For example, I visit a number of reports in Google Analytics and Facebook to check on important data. Most of the times, I’m interested in the data of the current day. Now, the problem is that the website URL in the bookmark only includes the day I created the bookmark and not the day I’m interested in. This means that I have to manually adjust the report’s date to get to the numbers I’m looking for. I know, it may sound as if I’m overreacting but if you open up 5 different reports at once, you get annoyed pretty quickly. If you know what I mean and suffer as much as I do, then I have a solution that will automate the process of getting today’s view of a website (as long as the date is part of the URL). The solution here is to use a bookmarklet that does the job for you. Check the date in the URL you want to make dynamic. How is it formatted? With a hyphen between the numbers or all together (eg. 2015-12-21 or 20151221). If it’s the former then you don’t need to adjust the date in the code. If it’s the latter, you need to change the first blue bit to y + m + d. Basically, you need to remove these two bits ‘+ “-” +‘. The date is probably gonna be somewhere in the middle of your URL. Therefore we need to split up the URL where the date should come in. In the example you can see that the URL is separated using the single quotation mark (‘) and the date is concatenated with plus signs (+). Replace the example with your own URL and split it up and add date accordingly. Make sure to put a single quotation mark at the beginning and end of the URL as shown in the example. When you think that you replaced the necessary parts correctly, you can save the code as a bookmark and try it out. 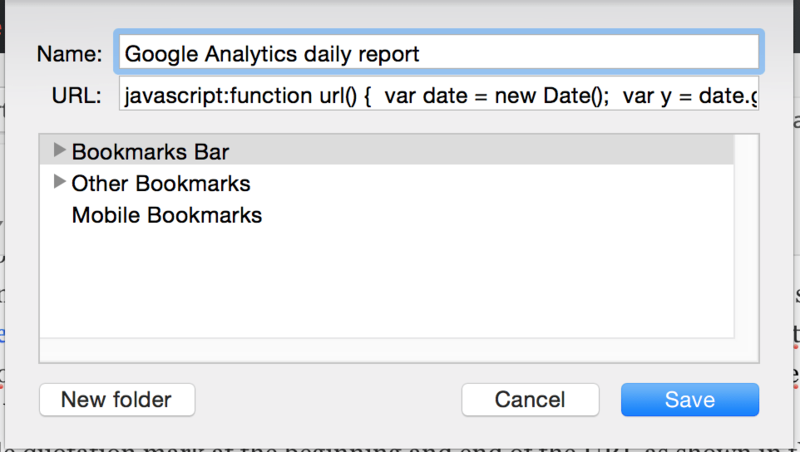 Right click on an already existing bookmark (like the one to your report). Copy the code in your text editor and paste it into the empty URL field. Click on the bookmark. If you did it correctly, the URL should open up in a new tab in your browser with today’s date selected. I hope you get it to work on your first try and get to enjoy the magic of bookmarklets. If not, you can always revisit the steps or check the loaded URL for mistakes and fix them in your code. Also, feel free to drop a comment if you’re stuck.